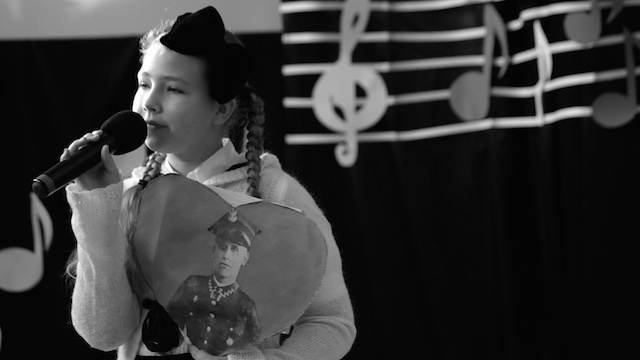 Film tells the story about contest of patriotic songs for children from primary schools in Poland. Film by presenting performances and the audience, tension between parents and teachers and finally jury deliberations rise the questions about what is patriotic for young generation. Documentary film director. Graduated in Film Studies in Lodz University, Gdynia Film School in Poland. Continue his education in Academy of Media Arts Cologne in Germany. He took part in exchange program with EICTV in Cuba, EsoDoc Workshops, Goshort Talent Campus, Polska Doc. Involved in social documentary projects, search for new forms of communications using Internet or non-documentary forms. He organized film workshops for children and youth in Turkey, Romania and Poland. His first short film “Walk” was awarded Students Price Jury on Krakow Film Festival in 2012. In 2015 with artist Angelika Herta created webdocumentary project www.Bobkowski-co-dalej.pl in France based on the journey of polish writer Andrzej Bobkowski.